Here in Cayambe, it’s always Spring! There is a saying, “April showers bring May flowers.” We have truly been showered with blessing this month. In 3 John 4 the apostle says, “I have no greater joy than to hear that my children are walking in the truth.” God is moving in amazing ways among our people. Brenda is doing a Bible study with three young, single mothers who are each in a different stage in restoring their walk with God. Dave is working with the youth group preparing for Youth in Action, which includes Bible quizzing, preaching and teaching competition. We have several teens returning to fellowship after being drawn into the world. Many unsaved parents of the youth are also now attending Bible studies as well. Please continue praying for our young people and their families as they strive to follow Christ. 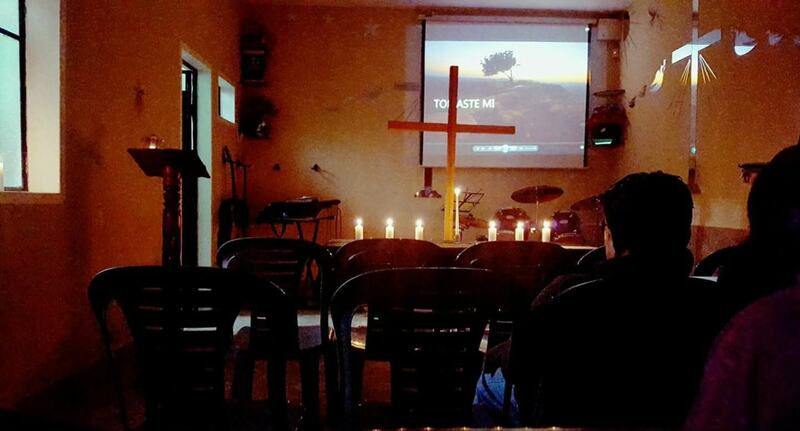 Our celebration began with a very special Friday night service following a liturgical tradition called a Tenebrae. It was a candlelight service in which various people read passages from the crucifixion story. They successively extinguished candles until only one candle, representing the life of Christ remained. On Saturday, we had an afternoon of games and a showing of the movie “The Case for Christ”. Then Sunday, as is our annual tradition, we had a joint service with our sister church in El Quinche. In previous years, we had the service on the patio of our church. As both congregations grow, we really don’t fit on the church property any more. This year, we rented a local private High School. 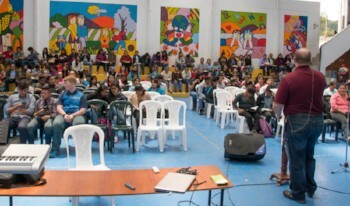 The facility was ideal to host the over 200 people who came out. We had a great service in their auditorium as well as baptisms in the swimming pool. Then we spent the afternoon playing sports, games and swimming. You can see a photo album of our day at our Flickr page. In addition to the church-planting work in Cayambe, Dave also helps out a great deal in the association of churches we work alongside. He recently spent a week translating for a leadership conference led by Crossworld board member, Dr. Tony Hart. He also serves on the Mission Committee helping develop the Ecuadorian missionary program, the Youth Leadership Committee guiding the other youth leaders of the association churches, and the Camp Coordination Committee helping plan the five weeks of camp coming this summer in addition to being a conference speaker for the camps and youth rallys. Finally, he also attends the monthly pastor’s meeting where the major decisions of the association are made and where the pastors find mutual fellowship. Please pray for these ministries of the association and for Dave as he travels back and forth to various meetings each month. David Garcia has been doing very well at Word of Life in Argentina. He just finished his third year of study and is now beginning his fourth and final year. Because of your faithfulness, his school year is fully paid. He will be entering a new phase of study for fourth year students that emphasizes church planting and practical ministry techniques. Please continue to pray for David that he finishes well and for his family and our church as we await his return. We are all looking forward to David joining us in the ministry in Cayambe when he graduates in April of next year.